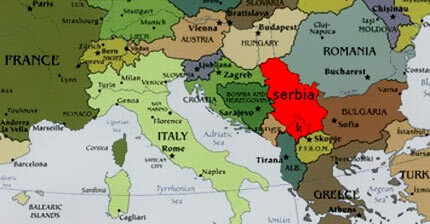 On this map the today’s republic of Serbia is represented in red. As you can see, it is located in Southeastern Europe, on the famous peninsula known as the Balkans. Throughout the history, its mountains and valleys have been separating and connecting two worlds: The East and The West. The small region in the south, marked with letter "k" is known as Kosovo - by some, a part of Serbian territory, and by others, a new country that has recently proclaimed its independence. Serbia or not Serbia, traveling in Kosovo may involve certain risks, as this area is at the moment still politically unstable and volatile. Do I need a visa to enter Serbia? For nationals of many countries, no visa is required for a tourist visit to Serbia. The most accurate (and regularly updated) info can be found on the website of the Ministry of Foreign Affairs. Follow this_link to go directly to the page where you can check whether you need a visa for Serbia or not. If there is an Embassy of Serbia in your country, you should try getting your visa there. However, such an Embassy doesn't exist in a number of countries - in which case you should try to get your visa in another country along the way. Follow this_link to check if there is a Serbian Embassy in your country - the web page also has all the addresses of Serbian embassies and consular missions abroad. What to do if I want to continue my trip to another country? In case you want to continue your journey, to another country, you may need to get some visas in Belgrade. There are a number of foreign embassies in Belgrade - to check if the one you need is among them, and also to find out the address and the phone number, follow this link. Where can I cross the border to / from Serbia? Here you can find the complete list of border crossings to / from all neighboring countries. What do I need to have in order to get visa? 5) Certificate that a health fund shall cover the medical costs in Serbia, if any. Are there any transit visas? Transit visa applicants are required to obtain the visa for the country they will enter after the transit through Serbia. By presenting this visa at the Serbian Embassy, they will receive a transit visa. You should carry your passport at all times for identification. Serbian is a Slavic language used primarily in Serbia and Montenegro. You can also use it in Bosnia and Croatia, since differences among these language varieties would not hinder your ability to understand and be understood. If you stick to basic conversations you can easily get by in Bulgaria and Macedonia. Serbian is a completely phonetic language, meaning that every letter represents only one sound, and every sound is represented by one letter. The formula concocted by Vuk Karadzic, the great 19th century reformist of the Serbian Language, goes "write as you speak, read as it's written" - thanks to this, learning the 30 letters of the alphabet is all you'll ever need in order to read Serbian. One of the rather confusing things about Serbian language is its alphabet - actually, its alphabets, since two of them are used parallelly. Latin and Serbian Cyrillic are completely equivalent and all Serbs are familiar with both. There is no general rule in choosing the alphabet - street names, newspapers as well as train schedules are sometimes written in Cyrillic and sometimes in Latin. You can easily reach any part of the world from Serbia, using telephone connections. Mobile telephones and public telephone booths are at your disposal. Pay-phone cards, 063/064 cell phone SIM cards as well as airtime to the value of 200, 500 and 1000 dinars are available at most kiosks. Calling from hotels, restaurants and other facilities is usually very expensive, but there are telephone boxes, usually very visible. You may buy a telephone card on almost every tobacco shop or newsletter shops. On the mobile phone side, there are a few service providers, both for contract-based mobile phone services and for prepaid mobile phones. Those providers are: Telenor, VIP and MTS. The area code number for Belgrade for national calls is 011. The country code for Serbia and Montenegro in international communications is 381. To place a call to Belgrade from abroad, the 0 should not be dialed, i.e. the area code number to dial is 381-11. To place an international call dial 99 first, then the country code, then the area code for the city, and finally the phone number of the subscriber. Tap water is safe and pleasant to drink. International credit cards such as Visa and MasterCard are accepted in most shops, hotels and restaurants in Serbia. As elsewhere in the ex-Yugoslav republics, the most frequently exchanged currencies are the Euro and US Dollar (Pound Sterling is rarely used). You can change money at any of hundreds of MENJAČNICA (exchange offices) in Serbia. Gone are the days of fluctuating rates and black market rates - all exchange bureau (including those in the airport, shops, hotels, etc.) have to use almost the same rate, so you can change anywhere without fear of being overcharged. Banking Hours are usually Mon-Fri 08.00-19.00, Sat 08.00-15.00. Some are open on Sunday. Traveler’s Cheque is acceptable in theory, but in practice these can be very hard to exchange. It is advisable to take hard currency and credit or debit cards. The climate of Serbia varies from a continental climate in the north, with cold winters and hot and humid summers, and well-distributed rainfall during the year, to a Mediterranean climate in the south of the country with hot and dry summers, and winters relatively cold with heavy snow inland. Winter temperatures are very cold, the average minimum temperature in January in Belgrade is -3°C, while the average maximum temperature is 3°C. Summer temperatures are pretty hot, with average minimum temperatures in July in Belgrade 16°C, and average maximum temperatures of 27°C. The rainfall varies between 560 and 1900 mm per year, the amount of rain will change depending on the height and exposure. Vojvodina is the least rainy area of the country. The rainy months are those of late spring and late autumn, winter precipitation occurring for most in the form of snow, there are 40 days with snow in the northern plains of and more than 120 days a year with snow in the southern mountains. The ski season runs from November to March. Novi Sad, Serbia is the main administrative centre of the northern Serbian province of Vojvodina, and the administrative centre of the South Bačka District. The city lies in the southern part of Central Europe's Pannonia Plain, on both banks of the Danube River. 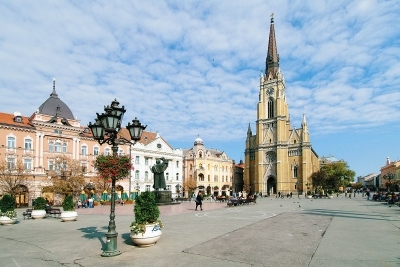 Novi Sad is Serbia's second largest city, after Belgrade. According to the data from November 2009, the city had an urban population of 283,634, while its municipal population was 370,101.The city is located on the border of the Bačka and Srem regions, on the banks of the Danube River and Danube-Tisa-Danube Canal, while facing the northern slopes of Fruška Gora Mountain. Since it was founded in 1694, Novi Sad became the centre of Serbian culture and earned its nickname Serbian Athens. Today, Novi Sad is a large industrial and Financial Centre of the Serbian economy; and it is also one of the biggest construction sites in the region. The name Novi Sad means "New Plantation" (noun) in Serbian. It is a translation of the Latin word "Neoplanta," which was given by Maria Teresia. As a meeting place of cultures and people, Novi Sad came to have many different names in various languages. Taken from the Wikipedia . What people from Novi Sad say about their city? It is hard, if not impossible, for us, the citizens of Novi Sad, to talk about our city or to show its pictures in an impartial way, without showing how much we love it and how much we are struggling to remain worthy of its past. It is a city one gets to know and love easily, but also a place hard to forget and leave forever. Novi Sad is a simple city, hospitable and open-hearted to all of its visitors, built by measure of a man. By its charm, culture and nightlife, Novi Sad is similar to Belgrade, the capital of Serbia, but because it is smaller, there is more a personal tone to everything in a laid back environment. That is why Novi Sad is considered to be a perfect combination of urban sophistication and bohemian relaxation. A multiethnic (Serbs, Croats, Hungarians, Slovaks, Gypsies etc.) foundation on which Novi Sad was built, makes it a very tolerant, peaceful environment with a specific charm to it. Across from Novi Sad, on the right bank of the river Danube, is the small town of Petrovaradin. Novi Sad and Petrovaradin are considered to be twin cities. They are separated by the Danube but connected by 3 bridges which are of essential importance for these two towns. However the most outstanding feature on the right bank of Danube is the Petrovaradin Fortress. Often called “Gibraltar on the Danube”, Petrovaradin Fortress dates back some 600 years and is a maze of alleys, trenches, gates, underground tunnels and galleries. Every July, the Fortress also hosts the EXIT music festival, which turns Novi Sad, into a music capital of Europe for the duration of the festival. Novi Sad is becoming more and more popular with students. According to the data of the Institute for Statistics, there are 19 faculties and five colleges in Novi Sad. Every year a large number of students come to Novi Sad. In academic year 2006/07, 34,188 students enrolled at a faculty, while 4,306 students graduated in the same academic year. Novi Sad is developing regarding tourism as well. In 2006, the average number of overnights of domestic tourists was 1.9, and 2.1 of foreign tourists. If you want to use local transportation you can take a bus or a cab. In order to travel to other cities in Serbia you can take bus or a train. Novi Sad has an excellent bus service. Ticket for one ride (no matter how far you go as long you don't change the bus) costs 40RSD and is bought at driver. Taxis are not overly expensive (by Western standards), the minimum fare varies between 80 and 100 RSD, with a cross-city trip typically costing 150-200 RSD. It helps to have the address written out although many taxi drivers speak fair English. However, be careful of taxis unaffiliated with one of the major firms (especially at the train station), or you may pay up to four times more than your fare should be. When taking a cab make sure that the meter is running. The city centre is actually quite small and most of the interesting sights, bars and hotels are all within easy walking distance. There are plenty of street maps, especially in the centre, so you can find your way easily. The fortress of Petrovaradin on the right bank of the Danube is a fortress that no enemy has ever taken. It now contains a museum, "Muzej Grada Novog Sada" (Novi Sad City Museum) gathering all ancient objects of the region from the prehistorical era until today, large number of small art studios and living spaces of artists, underground military galleries - corridors, few clubs and few cafes and a delicatessen. It also has a small Observatory and Planetarium, open on Saturdays from 7PM-12PM. The observatory is open when skies are clear, while the Planetarium, which is near the Museum, is open every Saturday. The staff is young, fun and speaks excellent English. The 5* hotel and three restaurants offer beautiful views of the Danube and of Novi Sad, and have recently been reopened, after extensive renovation and refurbishment works. Castle “Dundjerski” an old castle, wonderfully preserved, situated to the north of Novi Sad. Open: 9-16 every day except on Monday. Foreign art collection Situated at 29 Dunavska Street, Open: 9-16 every day except on Monday. Open: 9.00-19.00h on working days, closed on Monday, 9.00-14.00 h on weekends. Entry price for foreigners 100 RSD. This festival, founded in 2000 an onset to the democratic revolution in the country, attracts more and more visitors every year. It has a wider variety of music genres such as Rock, Dance, Reggae, Hip-Hop, Folk, and Techno. Many world famous bands played on the festival (Slayer, Moloko, Iggy Pop, Snoop Dogg, Wu-Tang-Clan, Public Enemy and many DJs from around Europe and Asia) and in the year 2004 it was listed as the biggest cultural event of South-Central/Eastern Europe. The Železnicar Association of mountaineers and skiers organizes a hiking trip every Sunday on Fruška Gora Mountain and in the Novi Sad vicinity. In summer you must visit “STRAND" the most beautiful sand beach on the Danube River! It is open usually from 15 May to 15 September. After a hearty breakfast with meat, Serbians traditionally work eight hours straight before having their "lunch" between 15:00-18:00. Obviously this is by far the biggest meal of the day, with huge quantities of soup, roasted meat and potatoes, and a pickle salad as a side dish. Novi Sad being the capital of "bacon heartland" Vojvodina, vegetarians can be frowned upon. Restaurants are typically open until 22:00. "Martha's Pub" Laze Teleckog Street. "Bela Lađa" - international restaurant with gipsy music in the center of Novi Sad. "Cuba Libre" Laze Telečkog Street. "Trema" (Stage fright) - one of the largest bars in Novi Sad with a lot of musical events and mixed audience. Situated in the Serbian national theatre.